Pam Towery, assistant professor of nutritional science and director of the program, talked about healthy eating habits with KLEK-FM listeners as part of the station's "Community Conversations" series. 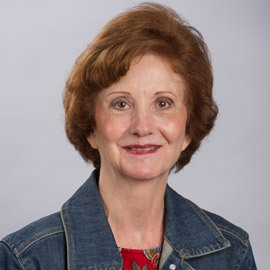 She is one of several A-State faculty and staff who recently have been program guests: Dr. Tom Risch, Biological Sciences; Dr. Shawn Drake, Physical Therapy; Dr. Rebecca Oliver, Honors College; Dr. Marti Allen and Jill Kary, Museum; and Renee Miller, Nursing. JONESBORO — Home I.V. Specialists has established the Dean’s Excellence Fund at Arkansas State University with a gift of $50,000. This endowed fund will provide A-State’s College of Nursing and Health Professions an opportunity to enhance the educational experience for the college’s students by strengthening its programs, faculty and facility. Emergency responders in Poinsett County recently summoned Dr. Brent Cox, assistant professor of disaster preparedness and emergency management, to assist with rescuing two men entrapped in a grain storage bin. Cox teaches the Farmedic course and has expertise in techniques used to extract workers trapped in grain. The rescue took several hours, but ended successfully with the two men pulled to safety. KAIT coverage gives details. In Keeping Current, the newsletter from Federal Emergency Management Agency (FEMA) Region 6 Mitigation, one of the articles features A-State's Regional Center for Disaster Preparedness Education, which is directed by Dr. Deborah Persell, professor of disaster preparedness and emergency management. The center is helping answer a growing demand for training by offering online and classroom-based courses, and training opportunities with professional emergency responders. Dr. Jody Long, assistant professor of social work, recently gave a presentation about mental illness and geriatrics for Total Life Healthcare at St. Bernards Medical Center. While many think the most common mental illness among elderly is depression, it actually is anxiety. Long said most older adults suffer from some form of anxiety because of life changes such as loss of spouse, finances, health problems and lack of independence. JONESBORO – The Regional Center for Disaster Preparedness Education at Arkansas State University Monday evening completed another step toward establishing a training center in Lawrence County for professional disaster response personnel. The Walnut Ridge City Council adopted a resolution confirming support from the Council and Mayor Charles Snapp for construction of a disaster training center on 80 acres of land at the Walnut Ridge Regional Airport. The resolution noted the training center would be in the city's best interest because of the large number of visitors it would bring to the community, making a positive impact on economic development. "Farmedic is designed for first responders who may potentially be challenged with responding to an agriculture-related emergency," according to Dr. Brent Cox, assistant professor of disaster preparedness and emergency management. "This course is a 12-hour hands-on and lecture-based certification class, and continuing education units (CEUs) are available." JONESBORO – Working with city officials in Walnut Ridge, the Regional Center for Disaster Preparedness at Arkansas State University today completed the first step toward establishing a training center for professional disaster response personnel. Representatives from the university met with the Walnut Ridge Airport Commission to explain the proposed concept for a disaster training facility at Walnut Ridge Regional Airport. Following discussion, the commission unanimously voted its support for Chairman Don Cavenaugh to sign a Memorandum of Understanding (MOU), giving its support to proceed with negotiations for a lease agreement on 80 acres on airport property. CLS (Clinical Laboratory Sciences) -- Sept 19-20, 2013 -- Accreditation through October 2018. Diagnostic Medical Sonography - Accredited through Jan 2019. MRI (Magnetic Resonance Imaging)—Accredited through December 2016. MSW (Masters in Social Work)—April 29, 2015—Site visit April 2015. Radiation Therapy—Sept 12 and 13, 2011---Accredited through September 2019. Physical Therapist Assistant—Sept 25-28, 2011---Accreditation through 2022. Dietetics—July 27-29, 2016— Accredited through December 31, 2023.. Nursing (all programs)—Feb 14-16, 2012—Accreditation through 2020. Disaster Preparedness & Emergency Management - June 18 & 19, 2012 - Pending Report from Foundation For Higher Education Accreditation. DPT (doctorate in physical therapy)—Accredited through Fall 2022. OTA (Occupational Therapy Associate) - April 2016 - Next Site visit 2021. OTD (Occupational Therapy Doctorate) - Granted Candidacy for accreditation. *The department of Social Work - 3rd floor of the Smith Building. They are in suite 327. *The Beck P.R.I.D.E. Center - Reynolds Center for Health Sciences, room 170. *Nurse Anesthesia - Reynolds Center for Health Sciences, 3rd floor. *Communication Disorders - Reynolds Center for Health Sciences, 2nd floor, Suite 211. *The Speech and Hearing Clinic - Reynolds Center for Health Sciences, 1st floor, Suite 101.